A diverticulum is an outpouching of the bowel wall composed of mucosa. They are most commonly found in the sigmoid colon, but can be present throughout the large bowel and even (albeit less commonly) small bowel. Diverticulosis is present in around 50% of >50yrs and 70% of >80yrs, yet only 25% of these cases become symptomatic. The disease affects men more than women and is more prevalent in developed countries. Diverticular disease is the 8th most frequent outpatient gastrointestinal diagnosis made in the US, with nearly 3 million associated health care visits occurring each year. In an aging bowel that has naturally become weakened in certain areas over time, the movement of stool within the lumen will cause an increase in luminal pressure. This results in an outpouching of the mucosa through the weaker areas of the bowel wall, creating pockets in which bowel contents, including bacteria, can accumulate. Bacteria can overgrow within the outpouchings, leading to inflammation of the diverticulum. If a diverticulum perforates into the abdominal cavity, a diffuse peritonitis will result, however if the infection remains contained within diverticula (covered by mesentery), a phlegmon or abscess can develop, which presents with localised peritoneal signs. In severe or chronic cases, fistulae can form, most commonly as colovesical or colovaginal. Younger patients with diverticular disease have been shown to have more active disease with higher re-occurrence and complication rates. Diverticulitis is classified as either simple or complicated. Complicated diverticulitis refers to abscess presence, fistula formation, stricture, or free perforation, whilst simple diverticulitis describes inflammation without these features. The risk factors for the formation of diverticulum include low dietary fibre intake, obesity (in younger patients), smoking, family history, and NSAID use. A large proportion of individuals with diverticulosis remain asymptomatic and are only found incidentally, such as during routine colonoscopy or CT imaging. A patient with diverticular disease may present with left lower abdominal pain (typically a colicky pain, relieved by defecation), altered bowel habit, nausea, or flatulence. Diverticulitis will present with abdominal pain and localised tenderness, classically in the left iliac fossa*, alongside potential pyrexia, nausea +/- vomiting, PR bleeding (usually sudden and painless), or anorexia. PR exam is typically unremarkable. The important differential diagnoses for diverticular disease are inflammatory bowel disease or bowel cancer. Other causes of abdominal pain should also be sought including appendicitis, mesenteric ischaemia, gynaecological causes, or renal stones. Any patient with suspected diverticular disease should have initial routine blood tests performed, including FBC and CRP. Those with suspected diverticulitis, should also have a routine bloods, alongside a Group and Save and a venous blood gas, to aid clinical assessment. A urine dipstick may prove helpful to exclude any urological causes. In patients with suspected uncomplicated diverticular disease, a flexible sigmoidoscopy* is a good initial approach as this will identify any obvious rectosigmoidal lesion. For cases of suspected diverticulitis, a CT abdo-pelvis scan (Fig. 2) should be performed, as they have a high level of sensitivity for detecting the condition and any complications that made have developed. CT findings that can suggest diverticulitis include thickening of the colonic wall, pericolonic fat stranding, abscesses, localised air bubbles, or free air; a “microperforation” is a radiologic diagnosis that reflects a localised perforation and inflammation. *A sigmoidoscopy or colonoscopy should never be performed in any presenting cases of suspected diverticulitis, due to the increased risk of perforation. Acute diverticulitis can be staged using the Hinchey Classification, a classification system based on CT findings. It can be used to aid clinical management and importantly higher stages are associated with higher morbidity and mortality. Patients with mild uncomplicated diverticular disease can often be managed as an outpatient with simple analgesia and encouraging oral fluid intake. Conservative management for a patient with suspected or confirmed diverticulitis is with IV antibiotics, IV fluids, bowel rest (only clear fluids orally), and analgesia. Uncomplicated cases can also be managed in the outpatient setting, especially if the patient is systemically otherwise well and no significant co-morbidities or immunosuppression. Symptoms typically improve within 2-3 days after the initiation of treatment. Often the diet can be advanced from clear liquids to a low-residue diet, and IV antibiotic therapy swapped to oral treatment. Clinical deterioration or lack of improvement should prompt repeat imaging. Surgery is eventually required in 15-30% of patients admitted. Surgical intervention will typically be via bowel resection, typically via a Hartmann’s procedure, however resection with primary anastomosis and loop ileostomy may also be attempted. Laparoscopic peritoneal lavage* can be trialled, however is not currently advocated in clinical guidelines. *A recent meta-analysis showed no difference between resection vs. lavage for acute perforated diverticulitis in mortality, 30-day reoperations and unplanned readmissions, however lavage was associated with higher rates of intraabdominal abscesses, peritonitis, and increased long-term emergency reoperations. A Hartmann’s procedure (Fig. 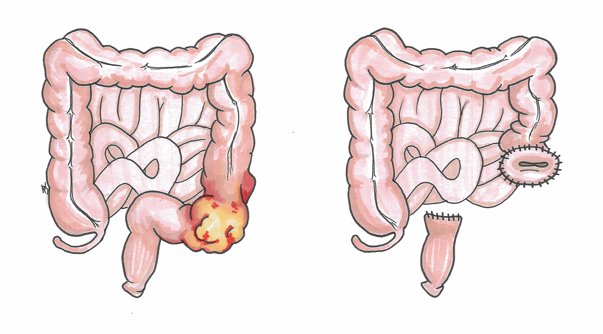 3) involves resection of the sigmoid colon, with the formation of an end colostomy and closure of the rectal stump. 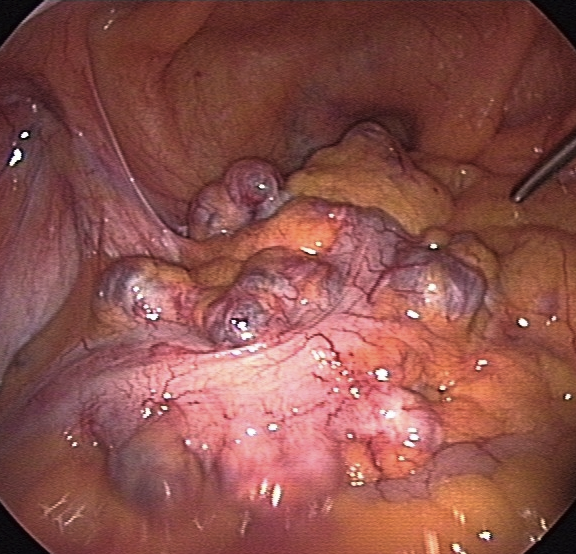 An anastomosis with reversal of colostomy may be possible at a later date. Unless a recent endoscopy has been performed, outpatient colonoscopy following resolution of diverticulitis should be arranged. All of the following are risk factors for diverticulosis except? A patient known to have diverticulosis and recurrent bouts of diverticulitis presents to the emergency room with a one day history of fever, chills, and significant generalised abdominal pain and tenderness. Which one of the following is likely to be the cause? A patient is admitted with extensive PR bleeding secondary to diverticulitis. Which of the following definitive management options would not be suitable? Which of the following is not an indication for surgical intervention in patients with diverticulitis?